The Mtech USA Ballistic "The Void" Assisted Opening Knife is a unique design. 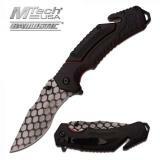 The knife features a stainless steel drop point blade. The blade features a futuristic design. The blade deploys rapidly and effortlessly through its assisted opening technology.